The microfilm I ordered from the Family History Library, which was supposed to contain the death certificate for my great grandfather, Melvin Van Every, came in at the library, so I looked through it. There were no death certificates from Dona Ana County. The film was labeled "Bernalillo - Grant Counties 1929." Dona Ana could have been misplaced in one of the other two rolls for 1929, but at $6/roll I didn't like the prospect of ordering the two other rolls and possibly discovering they completely failed to film Dona Ana for that year. So I did some more searching and found myself back at the NMGenWeb website. I'm not sure how I missed it last time I was there, but the volunteers at the Death Index offer to obtain photocopies of any death certificate listed in their index (which currently spans 1899-1949). $1 for the first certificate, 50 cents for each additional, profits going towards expanding the index. They're actually going to get $2 from me, as I will order the certificate for William Thetford, who I believe was the father of Melvin's second wife, Josie Thetford. There's also a "Jessie Thetford" who died in 1938, which I don't think is Josie, since if the 1930 census is correct, the age is about 8 years off, but we could have transcription or other errors either in the census or the death index, so it's certainly worth 50 cents. I don't yet have many photos of family cars. 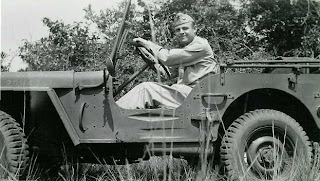 I have a photo of my maternal grandfather, Martin Deutsch, in a jeep, though it was property of the US Army. 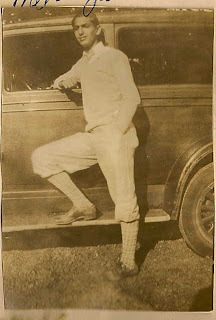 I have a photo of my paternal grandfather, Melvin Newmark, standing by a car. Is it his? Does he have a job as a valet? What kind of car is it? I don't know the answers to any of these. The writing snipped off at the top reads, in my grandmother's hand: Mel, June 1930. I'm thankful to her for several good photos of my grandfather when he was young. In 1930 she was 16 and he was 18. "The next time I go to El Paso I will go in the Buick and I generally get back the same day. We still have the original tires on it and it is always ‘rearing’ to go. I left the water in the radiator one night and it developed a small leak from freezing." My paternal second great grandfather, Selig (Dudelsack) Feinstein was a shoer of horses from 1890-1900. And horses were necessary back then to pull carriages. "Car" is just an abbreviation for "Carriage," and was utilized prior to automobiles. Alas, I have no photographs of family in horse-drawn carriages. My own personal car history is relatively short. The first car I ever drove was a hand-down from my father, a Toyota Cressida. It met its end one morning turning left out of a residential neighborhood onto a busy street. There were some bushes that blocked the view of oncoming traffic, and rain deadened some sound, so I didn't hear the fire engine's siren. No one was injured, except the car. 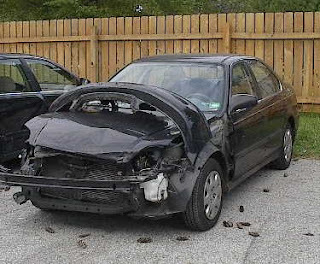 My first new car was a black 1999 Honda Civic. I only have one photograph of it, taken in 2003. My current car is a 2003 Honda Civic. And in August, G-d willing, I will own it. Two months ago I posted about how important it is to know when and how your recent ancestors died. At its most basic, if certain diseases run in your family, you can be tested early for those diseases. The American Cancer Society recommends those without risk factors to have a colonoscopy at age 50. For those with members of the immediate family with colon cancer, it is advised to begin checking 10 years prior to the age of the relative was diagnosed. My maternal grandmother died at age 51. This morning I had my first colonoscopy, and two polyps were removed. I'm 39. If I hadn't known about my grandmother, and waited until I was 50, there's a good chance I wouldn't have made it. While it isn't a lily, this bloom was picked by a father on Easter Sunday to share with his daughter (my maternal grandmother) - 82 years ago. It has surely seen better days, but how many blooms get to be preserved for 82 years? There were a few items new at Ancestry this week for the state of Missouri that caught my attention. Missouri Still Birth and Miscellaneous Records. This database contains various miscellaneous records from Missouri from 1805-2002. These records were mixed in with birth, marriage, and death records located on microfilm from the Missouri State Archives. Examples of types of miscellaneous records presented here include: still birth records, school censuses, board of education minute books, receipts, and probate records. These records come from the Missouri State Archives, but there are some pre-1910 records here that aren't at the state's Missouri Digital Heritage site. I suspect everything from 1910-1931 in this database can be found in the state's death certificate database. I was all prepared to discover that like the Missouri Birth Records they uploaded a few weeks ago, there were less than a dozen entries in the last thirty years or so of this database. But I was wrongly prepared. This is a conglomeration of marriage license applications, marriage licenses, and marriage indexes. While some counties have the actual licenses, with the date the marriage was solemnized, it seems St. Louis has only the applications, through 1959. The Ancestry index lists the application date as the date of marriage, which of course is wrong. There's no evidence the marriage happened, just that it was planned, and it almost certainly happened on a different date. After 1959 some marriages are indexed, but the only information you get is names, date, and the book and volume number, or certificate number. Of course, this could be more than you already knew, and you can use this information to order the certificate from the county clerk. I don't know what fraction of the marriage indexes they have scanned, but it's certainly not complete, for example there were only 24 marriages indexed for all of 1960 in St. Louis. I did find the applications for several family marriages, and one or two licenses for family members who were living in neighboring counties. Only one surprise. There is a marriage license (without a date of marriage) for a distant Cruvand cousin who prior research indicated never married. Of course, he might not have. This application also happens to have a parental consent signature for a minor female. So there could be a story there. 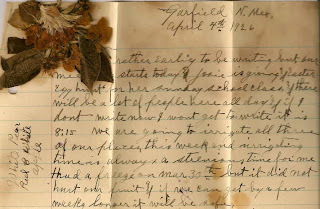 I have discovered a collection of about a dozen letters written to my grandmother, Myrtle Van Every, from her father, Melvin, between 1925-1927. Lots of new information, including a first name to the mystery individual she was married to between 1927-1929. Each letter from her father begins with "Dear machen"
All I can find on that word is that it is either German, or a misspelling of the Dutch for the verb "to make". I'm not sure how that translates into a term of endearment. Are there any German or Dutch speakers out there familiar with a noun-form of the word 'Machen'? To the left is a bio my great-grandfather Barney Newmark submitted to the North St. Louis Businessman's Association for their 1925 publication. Are such bios trustworthy sources? Let's take a look. Not quite. As I like to say, a suburb of Dublin, known as Warsaw. Google Maps will provide driving directions, and it will only take you 26 hours. Barney doesn't say "Oxford University" or "Oxford College". During the 14 years spent in London, England, he lived within walking distance of Oxford Street, and the Oxford Circus Railway Station. He was a student of life. For a while it was assumed this was also a stretch of his imagination. But I have learned that the London Polytechnic was the British equivalent of the YMCA, and they provided skills training to local youth. So there is a very good possibility this is true. He also would say that his birthday was March 17th. His birthday appears as April 14th on a few documents, but no birth certificate has been found. For awhile I assumed my great-grandfather, Melvin Van Every, died in Texas. Then I was reading something his daughter, Minnie, wrote, and realized he had moved to New Mexico after my great grandmother died, and he remarried. So then I went to the New Mexico government site to look up how to retrieve death certificates. New Mexico Vital Records are restricted access records and are only issued to immediate family members or individuals who demonstrate tangible legal interest. They define immediate family as: "mother, father, maternal grandparent, paternal grandparent (if father listed on record), sibling, child or current spouse." None of these are still alive. If they had included grandchild, I would have had my mother submit the request, which she would have gladly done. I wasn't very happy with the New Mexico government. Now I am only unhappy with whoever is responsible for their web page. It would be really nice if they mentioned that some death certificates from 1889-1945 are available on microfilm from the Family History Library. Which I can order at the local library I frequent. The International Society of Genetic Genealogy has comparison charts for several major genetic testing companies - for mtDNA and Y-DNA. Price, # of base pairs/markers tested, and the length of DNA storage seem to me to be the most important factors. But even though I have read several articles on other blogs and websites over the past several months, it is still somewhat confusing making a choice. 1905 – On November 8, Myrtle’s sister, Minnie Ray, at age 19, marries August Benold. 1916 – On January 8, Myrtle’s sister, Willa Ann Van Every Roberts dies at age 26, leaving behind a daughter, Agnes, age 5. 1918 - probable graduation of high school. Personnel records indicate she had a high school degree, and two years of post-secondary education. 1920 – Myrtle may be residing at Fort Bliss, in El Paso TX, at the QuarterMasterCorps, according to the census. (Surname on census is illegible.) She is a clerk at the QMC according to her personnel records. 1921 – Myrtle has begun working for the US Post Office in St. Louis according to her personnel records. 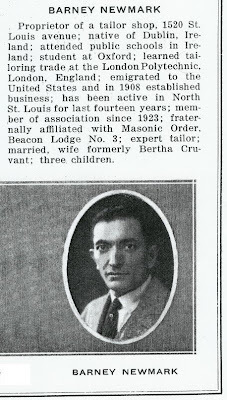 Myrtle’s brother Samuel, an optometrist, also moves to St. Louis according to the St. Louis City Directory. 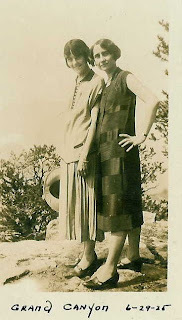 1923 – May 2, in Hudspeth, TX, at the age of 55, Myrtle’s mother dies of Chronic Interstitial Nephritis, a kidney disorder usually caused by a reaction to pain medication. 1926 – Sometime between 1926 and 1930 Myrtle’s brother, Samuel, moves to Kansas City. 1927 – Myrtle changes her surname to Ridgely. Personnel Records say due to a marriage. The marriage doesn't appear in St. Louis City, St. Louis County, or Kansas City indexes. 1929 – May 26, Myrtle’s father dies at the age of 66 in New Mexico. At some point in the past 6 years he had remarried. Myrtle also changes her surname back to Van Every. 1930 – On census, Myrtle is listed as divorced. 1936 – December 31, Myrtle marries Martin Joel Deutsch in Springfield, IL They were driving to Chicago to see Martin’s sister, Berta, get married. Martin also received a significant raise to his salary on Dec 31, 1936 according to his Personnel Folder. This may or may not be related. 1937 – January, Myrtle resigns from the Post Office. 1938 – Myrtle and Martin have a daughter. 1942 – In March, Myrtle’s husband Martin, already an Army reserve officer, enters active service, most of it spent overseas. 1945 – Myrtle and daughters are living in West Palm Beach, FL. 1945 – November, Myrtle’s husband Martin returns home from active duty. 1947 – Myrtle takes family on vacation to Texas to visit her sisters Minnie and Eva, and their families. 1951 – Sept 11, Myrtle dies of colon cancer at the age of 51. There are family rumors of a ‘fling’ in her late teenage years. This ‘fling’ may have been with a soldier, as the 1920 census says she’s married, even though her personnel records says she is using her maiden name. (Which isn’t mutually exclusive, even in 1920.) It would also explain why she is residing at Fort Bliss as a civilian. The personnel records in St. Louis were sparse…A signed oath of office, and a list of dates of promotions, salary increases, and name changes. I was extremely excited upon seeing this list, because my mother had known about prior brief marriage(s) but had no details, and had no idea Myrtle had been in St. Louis since 1921. I am awaiting the possibility of more records from Washington, DC. 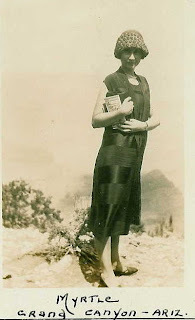 Unfortunately, it isn't known who accompanied her on her vacation to the Grand Canyon in 1925 from which the photos were taken. Her companion appears younger, and may have been a niece. I have managed to find a source discrediting my Chaucer descent this evening. According to "Plantagenet Ancestry: A Study in Colonial and Medieval Families" by Douglas Richardson, 2004, p. 55-56 (and wikipedia): Joan de la Pole was not the daughter of William de la Pole and Alice Chaucer. She was the illegitimate child of de la Pole and allegedly a nun named Malyne de Cay. This source then matches the OneWorldTree descent down through Margaret Harcourt. And I trust my ascent up through Joanna Chamberlain. (see previous entry) So there's only three unproven links to a direct descent from "someone mentioned in a Shakespearean play" - but that takes longer to say and explain than 'Chaucer'. If exploring the lives of celebrities seems a little tired, NBC has a solution: Find their relatives. The network is developing an American version of the hit British series "Who Do You Think You Are," where stars are shown the oft-surprising details of their ancestors' lives. In the UK version, the series uncovered backstories included tales of bigamy, wartime heroism and, in one case, attempted murder. Celebrity participants often are brought to tears as they learn about their relatives' hardships. Randy presents a few ideas for celebrities, and asks "Who would you suggest? Who do you want to know the ancestry of?" While it appears the UK version has focused on celeb's ancestral hardships, my personal choice would be Patrick Swayze. He's going through some personal hardships right now, and it would be great to uncover some information about his deep ancestry for him. Joanna Chamberlain is the earliest ancestor the researchers at Sweezey.net have accepted, but their descent from Joanna matches OneWorldTree's. I should be happy with tracing a line back to 1620, but the potentiality the earlier ancestors present is too juicy. So, if the researchers NBC hires could carry it any further back, I would be *most* appreciative. It should be noted that Joan De La Pole is the daughter of William De La Pole, the first Duke of Suffolk, who gets mentioned in Shakespeare's Henry VI Parts I and II. That could make it even more 'compelling'. Another fun guest might be Craig Newmark of Craigslist fame. Assuming not all celebrities are of the Hollywood type. Despite his surname he is not a known kin, though one never knows what one will find out in the future, so any research done for him might benefit me at some point. Other than these two selfish interests, my only hope is that they find some interesting stories to encourage more people to research their history. The RiverWeb:American Bottom Landing Site contains a large digital archive of artifacts related to the American Bottom region, defined as the area south of the confluence of the Missouri, Mississippi and Illinois rivers. This includes portions of St. Clair, Randolph, Madison, and Monroe Counties in Illinois. Most of the information on the site appears to be centered on the Cahokia Mounds, and East St. Louis. I discovered the site looking for East St. Louis City Directories. They have several completely scanned, downloadable as PDFs, but also searchable online, with the usual OCR limitations. 1893, 1900, 1905-1908, 1912. The 1908, and perhaps some of the other directories, are bi-directional, in that they also organize the directory by street address, letting you learn who the neighbors were, or what store a family lived above. The best way to search is to search the entire site, since there are other historical documents such as Bits and Pieces of East St. Louis History 1890-Present (c.2004) and the East St. Louis Blue Book for 1936. I downloaded all the City Directories from 1905 on since several of my Cruvant kin are in those directories. I was concerned because it was January 7th, 2008, and the Missouri Death Certificate index still only went up through 1956. Not that any relatives died in 1957, mind you. It was all philosophical impatience. I realized however they weren't finished scanning through 1956, so I figured that was the hold up. The silly volunteer-scanners wanted to finish that first. It's complete now. 1910-1957, indexed and scanned in. One thing I really like about Missouri's death certificate index is their 'advanced search' options. You can input a string and indicate that the name begins, ends, or contains that string. That's very useful when dealing with surnames of variant spellings. For example, one of my surnames is "Cruvant" which can also be Kruvant, Cruvand, or Kruvand. So I just enter: ruvan and check 'contains'. All the results are displayed. I wish other online databases had this option. I have found something new to be impatient about, and I might be impatient about it for awhile. An upcoming project for the Missouri Digital Archives appears to be their Penitentiary Records (1836-1939). It's so early in the project, all they have is the description. At least they're looking for more stuff to do. This weekend I received an envelope of childhood mementos from my parents. Included was the contract to the left, which no one ever told me about. However, even without knowledge, I believe I have held up my duties as defined by the contract, and it does say lifetime, so it should still be good. Now I just have to apply for the backpay that is clearly owed to me. A genealogist is researching two non-intersecting family trees. Members of one family always tell the truth, and members of the other family always lie. The genealogist comes to a brick wall. Standing at this wall is a member of each family, but the genealogist can't tell which family each belongs to. What question should she ask to break through the wall? Sigh…to belong to families of all truth-tellers, or all liars. That would make research so much easier. Can anybody read the occupation on the left? It's obviously the newspaper industry, and some sort of agent. It references Samuel (aka Stanford) Ophan Van Every, a brother of my grandmother. Unless I am confusing two individuals with similar names, and it doesn't appear that I am, he was a conductor (railway) in 1910, and an optometrist from about 1922-1933, so he had a diverse career. Route Agent as Karen suggests in the comments seems like an obvious choice now. I was trying to come up with something that began with a C or a P for some reason.